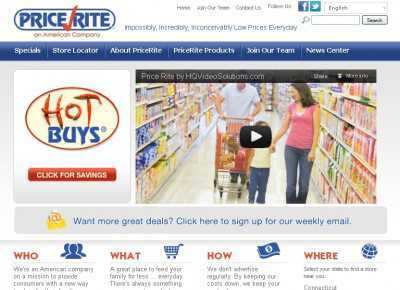 This is the website for PriceRite, a chain of American supermarkets that guarantees “impossibly, incredibly, inconceivably low prices everyday”. On PriceRiteSupermarkets.com you can check out all the products you can buy if you decide to shop there, and get coupons for buying them for even less. And you can also read the most recent news connected with the company, and (if you’re looking for employment) see which jobs are available there. All in all, PriceRite offers more than 500 products under its very own PriceRite brand. These include everything from canned fruits and vegetables to butter, breakfast cereals and fresh juice. Plus, the site includes information on food safety and product recalls, along with testimonials that have been provided by consumers. The site also comes with a store locator that lets you find the nearest PriceRite supermarkets. You can use it by picking the State and the City that you live in from a drop down box. 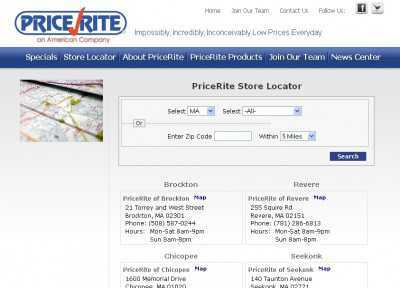 Currently, there are PriceRite supermarkets in Massachusetts, Connecticut, Pennsylvania, Maryland, New York and Rhode Island. Alternatively, you can supply your ZIP code and then pick the distance that you’re willing to go (between 1 and 20 miles) to see which PriceRite supermarkets are to be found within that mile radius.